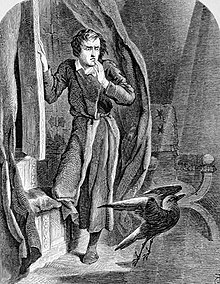 "The Raven" depicts a mysterious raven's midnight visit to a mourning narrator, as illustrated by John Tenniel (1858). "The Raven" is a narrative poem by American writer Edgar Allan Poe, first published in January 1845. It tells the story of a mysterious talking raven who visits a lover; it shows how the lover is slowly going insane. It is often called Poe's most famous poem, its publication made him famous in his day, and today it is still one of the most recognized and respected poems in American literature. This page was last changed on 9 March 2015, at 04:32.